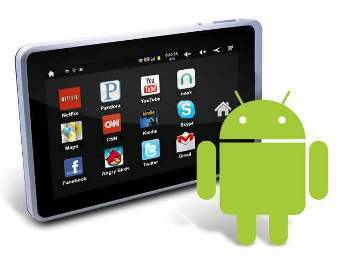 Most Widely Used Tablets which Runs on Android Operating System, which is specially designed for Mobile and Tablets. Mostly Tablets Runs on Android3.0 Version or Upgraded. Android does’t have any official Converter like iTunes, they have third party tools like Double Twist. ME Tablet X1 is the latest multi-functional gadget from HCL Technologies, which Runs on Android v2.3. The HCL ME X1 is accelerated by a High-performance Cortex A8 1 GHz Processor, and comes with 512 MB DDR2 RAM. HCL Tablet has a 7-inch Capacitive Multi-Touch display with a resolution of 800 x 400 pixels. Funbook is the Cheapest Android Tablet which Runs On Android 4.0(Ice Cream Sandwich) Operating System, It has 7-inch Capacitive Touchscreen with 1.2 GHz Cortex A8 Processor.This device also have feature Like Front camera 3.0 MegaPixel for video calling, 512MB RAMand 4GB internal Memory with Wi-Fi and 3G connectivity. Samsung Galaxy Tab runs on Android v4.0 (Ice Cream Sandwich) Operating System, It has 7-inch TFT Capacitive Touchscreen with 1 GHz Dual Core Processor. It has 3 Mega Pixel Primary Camera for Video Recording and 0.3 Mega Pixel Secondary Camera For Video Calling, 16 GB Internal Memory and Wi-Fi Connectivity. Sony S runs on Android v3.2 Honeycomb Operating System, and accelerated by a strong 1 GHz ARM Cortex A9 Dual Core processor.The Sony S has a primary 5 megapixel HD camera powered by Exmor Sensor and a 0.3 megapixel front-facing camera ideal for video calls over the Internet. It also comes with 16 GB internal storage which can be extended up to 64 GB by means of a microSD card. BB Playbook runs on QNX OS 2.0 which gives Smooth MultiTasking experience.The PlayBook is powered by a Cortex A9 Dual Core processor with PowerVR SGX540 graphics and 1 GB RAM that complement the operating system. A 5 megapixel camera is loaded at the back of the PlayBook that can record Full HD 1080p videos.